Today marks 28 years since the Americans with Disabilities Act (ADA) was signed into law. And although some folks lament that we still have access problems, I prefer to look at how far we have come on this day. Although accessible travel certainly wasn’t a priority back in the beginning, it has gained momentum over the years. And that’s not just because we don’t institutionalize folks who are disabled any more — it’s also because some hearty souls paved the way “back in the day.” And because they were my friends, I’d like to give credit where credit is due on this ADA anniversary. I first met Flora at a conference about 22 years ago. She was in her late 50s, and recently blinded by macular degeneration — but that didn’t stop her one bit. She and her husband Barry Weintraub founded Travel by Touch, and set out to show the world to other blind and low vision people. Flora taught me a lot about the needs of her travel segment, and she was also the one who always stressed the importance of the CRO for access-related airline issues. I’d like to think she smiles a bit every time I speak or write about the CRO, which believe me is often. Indeed Flora was a staunch advocate. Joan and I go back as far as Flora and I do. Not only did she have an agency that specialized in accessible cruises — Nautilus Tours & Cruises — but she advocated for more accessibility in cruise ships. She was also one of the first travel agents to actually put together accessible shore excursions. Although we still don’t have any ADAAG regulations for cruise ships, many lines have responded to the growing market for more accessible facilities for wheelchair-users and slow walkers. And Joan was a driving force for that, back before others were even thinking about it. So if you’ve every enjoyed an accessible cruise, then Joan Diamond is probably partially responsible for that. Carroll had an infectious personality — you couldn’t help but smile when you talked to her. She was just that kind of a person. She was an amputee with a zest for life. She founded Travel Turtle Tours (I still have my old t-shirt) and proceeded to take wheelchair-users and slow walkers on adventures around the globe. She realized that things weren’t going to be as accessible as they were at home, but she just went for it and made her own reasonable accommodations. She really helped a lot people realize that they could travel. Carol and her husband Bill worked as a team, but Carol was definitely the leader. She was a natural salesperson and a one time real estate agent and snow plow driver. Subsequently she developed MS and she later created one of the first online accessible travel databases. Carol was an active woman, and she shared some of her travel adventures — and misadventures — on her website and in many keynote speeches. Not only did she encourage others to travel, but she gave them the tools and resources to make their trips more accessible. She also acted as a consultant to many tourism providers, to help them increase their accessibility. Last but certainly not least, Betsy Volk is the only person on my list who didn’t own an accessible travel company, but that doesn’t mean she didn’t have a profound impact on the evolution of accessible travel. 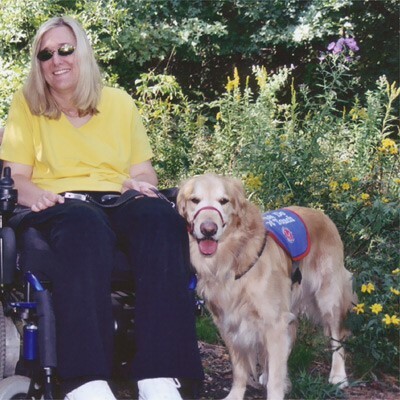 Betsy used a power wheelchair and traveled often for work with her service dog. She actually had two service dogs over her lifetime, but I was more familiar with her first one, Trooper. Betsy traveled in a time when service animals were a rarity, and she was a good ambassador. Trooper was well trained and very lovable, and it was good for the public to see him in action. And Betsy didn’t just travel to the easy places either. I remember one time we went over to Kellys Island in the middle of Lake Erie, where access was marginal, but we all had a blast. Betsy encouraged others to be more independent. Like Carroll Driscoll she definitely had a zest for life. I will also add that many of the folks who were the impetus for the accessible travel movement are thankfully still with us — Bonnie Lewkowicz, Ann Litt, Debra Briscoe, Laurel Van Horn, and many others that I’ve most likely forgotten. As I see advances in accessible travel I give thanks to all the folks — living and dead — that made this progress a possibility. Again, I like to give credit where credit is due. Do we have further to go with accessible travel? Absolutely. But at least we are moving in a positive direction. This entry was posted in Editorial and tagged accessible travel, ADA, Betsy Volk, Carol Randall, Carroll Driscoll, Flora Beck, Joan Diamond, regulations by Candy B. Harrington. Bookmark the permalink.